Don't let the weather stop your practice. 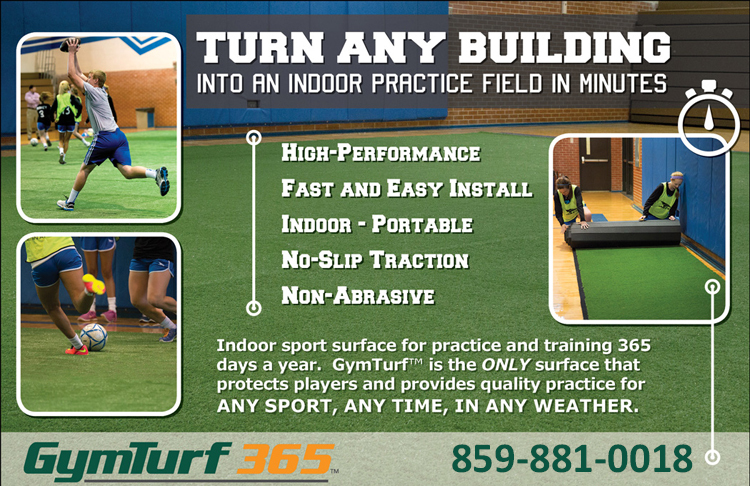 Turn any building into an indoor sport practice field in minutes. 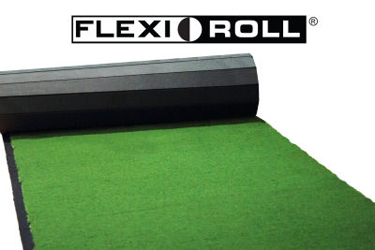 Portable, roll-out turf offers the ideal traction and performance to protect players for any sport, any time, in any weather. > Fast Setup - Easy roll-out and roll-up with the original Flexi-Roll® design. An average 50' x 75' floor can be installed in just 30 minutes. Stores easily in an upright position. > Traction - Get the traction you need for any sport. 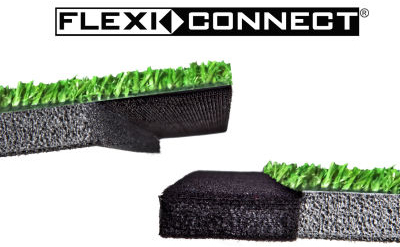 The patented Flexi-Connect® built-in connection system ensures the turf will not separate between seams for a 'No Slip--Just Grip' surface. The foam thickness is 5/8". Gain your edge! 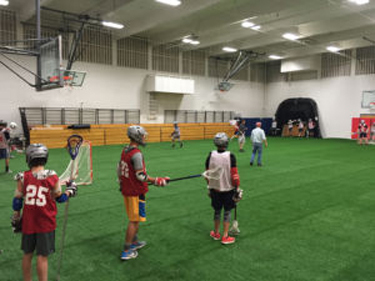 For practice and conditioning 365 days a year, GymTurf is the ONLY portable surface that protects players and provides quality practices for most ANY SPORT. Ideal surface for off-season or days when the weather restricts your ability to conduct a full speed practice. 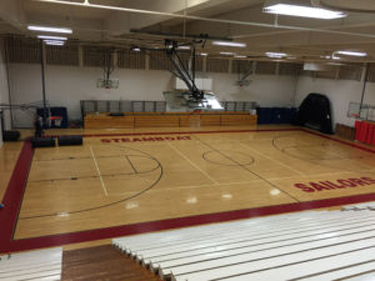 Offers an optional training space for Special teams. 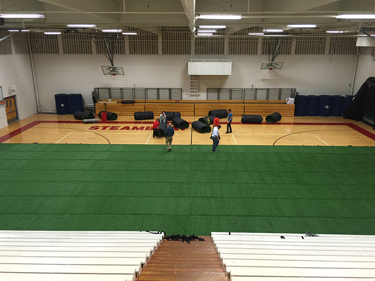 GymTurf is sold by the roll. > A 5' x 25' x 3/4" roll is $1,346 + freight. Each roll weighs around 100 lbs. When rolled is about 24" in diameter. > A 5' x 50' x 3/4" rolls is $2,588 + freight. Each roll weighs around 200 lbs. When rolled is about 34" in diameter. 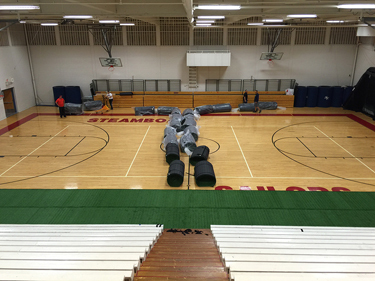 So, to cover a high school basketball court, you would need seventeen 50' rolls (rolled width-ways). Note: The foam bonded to the turf is much firmer that the foam used with the products for Cheer and Gymnastics, to better simulate the feel of natural turf. Made in the USA. Limited 5-Year Warranty. 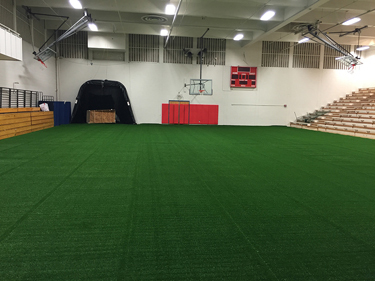 GymTurf 365 features Dollamur’s Flexi-Connect™ technology, a hassle-free integrated feature that connects turf sections without additional fasteners or tape. The patented system, which uses built-in hook and loop connections to join turf rolls, expedites set-up and tear down. The low-blade tufted turf requires no messy infill. This low impact, anti-abrasive flooring is engineered to reduce impact and allows teams to train around-the-clock with the same intensity as an outdoor session. 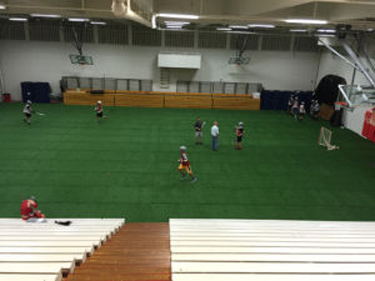 GymTurf 365 meets international soccer standards for artificial surfaces and enables field hockey, lacrosse and softball teams to replicate the outdoor field. These usually ship in 4 to 5 weeks.